Early dismissal on Wednesday made me dance like there were ants in my pants. I came home, made stuffing, roasted my turkey Bruce, hit the Dollar Store for some toiletries for the homeless and glasses for the shore, did my Christmas cards, and was attacked by dogs. Thanksgiving was a little different for us this year. We volunteered with my Mom to feed those in need. MFD and Dan ended up taking a bunch of the leftover food down to Kensington to feed people down there. In between our initial volunteering and going back to clean up and take food out for delivery, we stopped by Diane & Mike's for some coffee and I made my favorite sweet potato dish and some pan gravy and we ate. I went over to see my inlaws after I cleaned up the two bags of rice the wicked dogs got from the pantry and spread all over the main floor, including their bed. We walked in to find Mae napping on a bed of rice. Animals! Other dog things: Snuggly Geege and Mae getting a tick removed. Happy Thanksgiving pugs. I headed to the shore, chasing the most beautiful light down 95 towards Center City. At the shore I took the dogs for a long walk, went to see the huge moon over the ocean, read magazines and watched much of season one of 90210. MFD arrived around midnight. A different Thanksgiving but not a bad one! The Friday morning sunrise was insane. The ocean was roaring. It was incredibly nice on Friday. 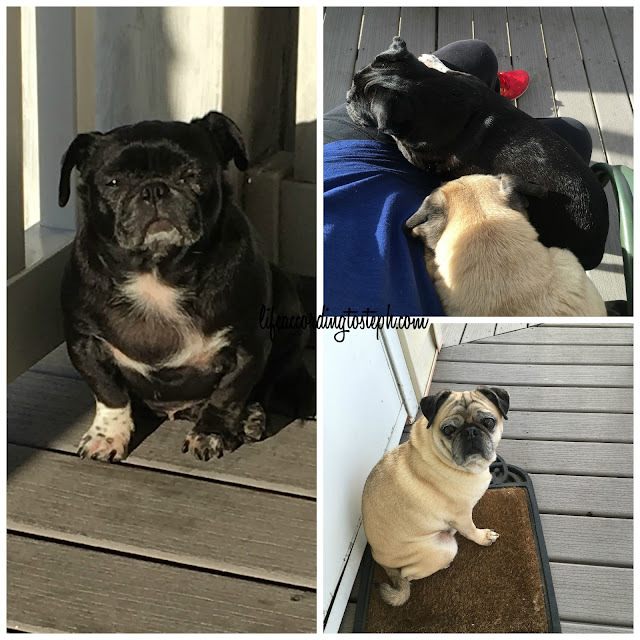 I spent the morning on the porch with the dogs, drinking coffee and giving MFD projects. Favorite sign and new folding chairs in bright yellow and lavender (I know it looks gray) from my dad & Carol and the Great Boat Debate 2015 happened this weekend. 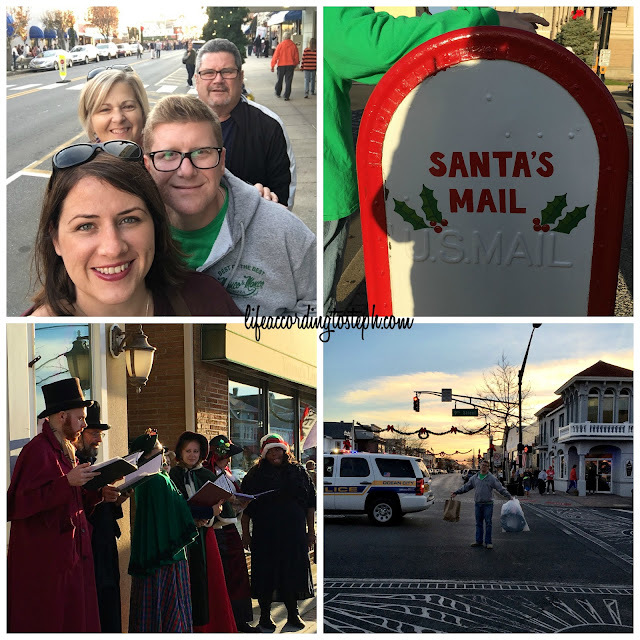 We strolled through the downtown district where they were having their Old Fashioned Christmas. There were carolers and some creep in stilts who was everywhere. MFD was in his glory in the thrift shop, buying Christmas decor. He even left early to decorate in peace. My Dad, Carol, and I stayed for the rest of the festivities. Ocean City's downtown Christmas was pretty cool. 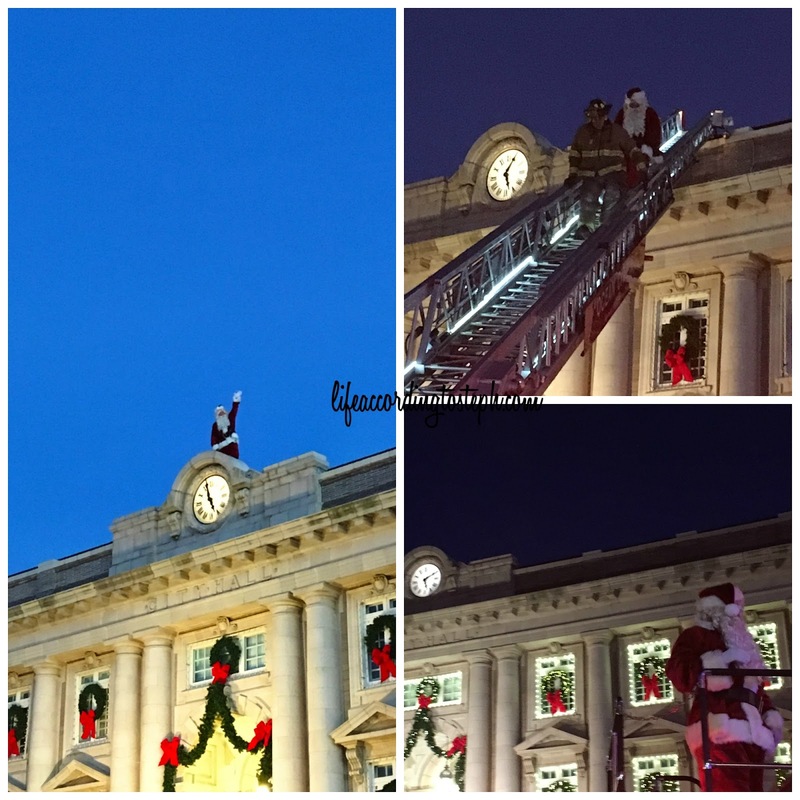 They put Santa on the freaking roof of City Hall and brought him down on a ladder. We came home to a house decorated by MFD and played some games of Decor Wars. Well, he and I did. Carol and my Dad just laughed at us. After my parents completed their shore chores, I gave them some free time because I am a benevolent boss. We hit the boardwalk for Small Business Saturday. We all took an afternoon rest, and then headed to Stone Harbor for their parade since MFD was in it. After we went to Cape May, which was not decked for Christmas like I thought it would be. Congress Hall looked beautiful and had a nice little winter carnival set up on their lawn. The food at Della's was good as always. They were even playing Dirty Dancing on their TV. They must've known I was coming. We got home at 10 and were all pooped. Sunday dawned cold and rainy and I was on the road home by 8:30. I did laundry and Christmas'd up the place. It's the same stuff every year, you get the picture. Decorating is exhausting - moving stuff all over and running up and down the stairs eleventy billion times. And outside to the spider house shed. Kill me. Against my better judgement, I went to the store Sunday. I had to get another valance at Marburn Curtain and I decided to go to Marshalls after. That was the experience straight from hell with a kid tossing a football in the breakables section and taking out three shelves.The shattering glass was deafening. I did get some things I needed and a few Christmas gifts. 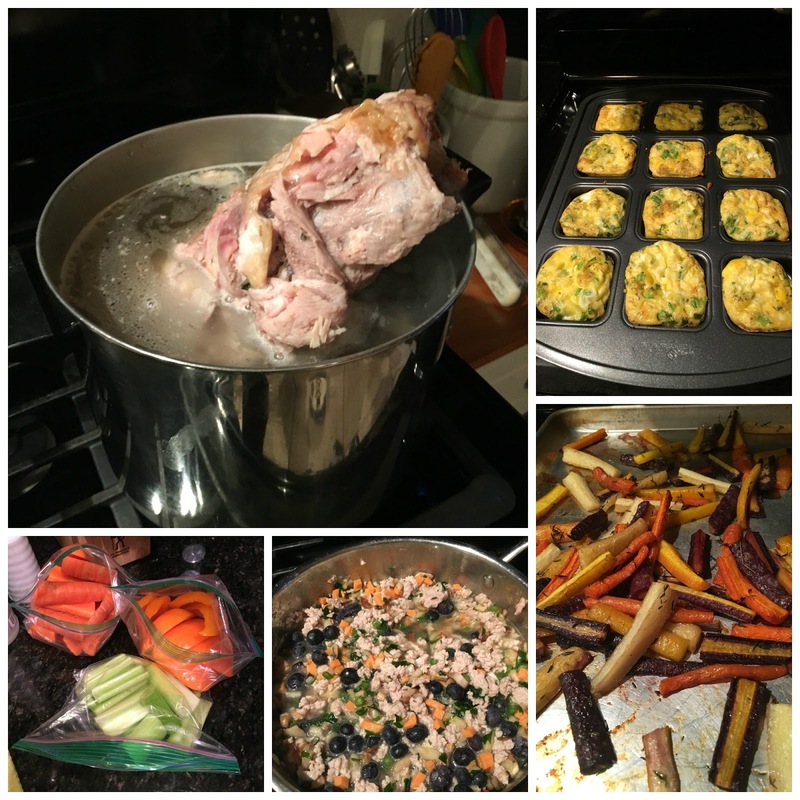 Weekly food prep: egg muffins with green onions and mozzarella for breakfast; turkey soup from the carcass for lunch and dinner; roasted multi colored carrots for dinner side; dog stew; and celery/carrots/orange bell pepper and granny smith apples for snacks. 24 days until Christmas. Gird your loins, my friends. You guys got a lot done! I love that you volunteered. The Christmas decoration wars is hilarious. I love to decorate so I side with MFD on this one. Though it is a lot of work. The shore pictures on the beach are so pretty. Looks like a FABULOUS Thanksgiving and very productive weekend. Love all the sunrise pictures, they are so pretty. And your food looks so delicious, how kind of y'all to give back. Oh my gosh it looks like a fun-filled Thanksgiving weekend. Good for you guys for giving back to those in need! Hopefully you're all recovered from everything! 2. That shore house and its accoutrements are a life changer. 3. The sunrises. Oh my goodness. 4. Your Thanksgiving day sounds like it was lovely. Lovely. This blog post sounded happy from beginning to end. I love that you have the shore house. Love you give of yourself to help with the homeless... says so much about your heart. Santa on the roof - haha... that's awesome! I love the carolers in their outfits... talk about the spirit of Christmas. 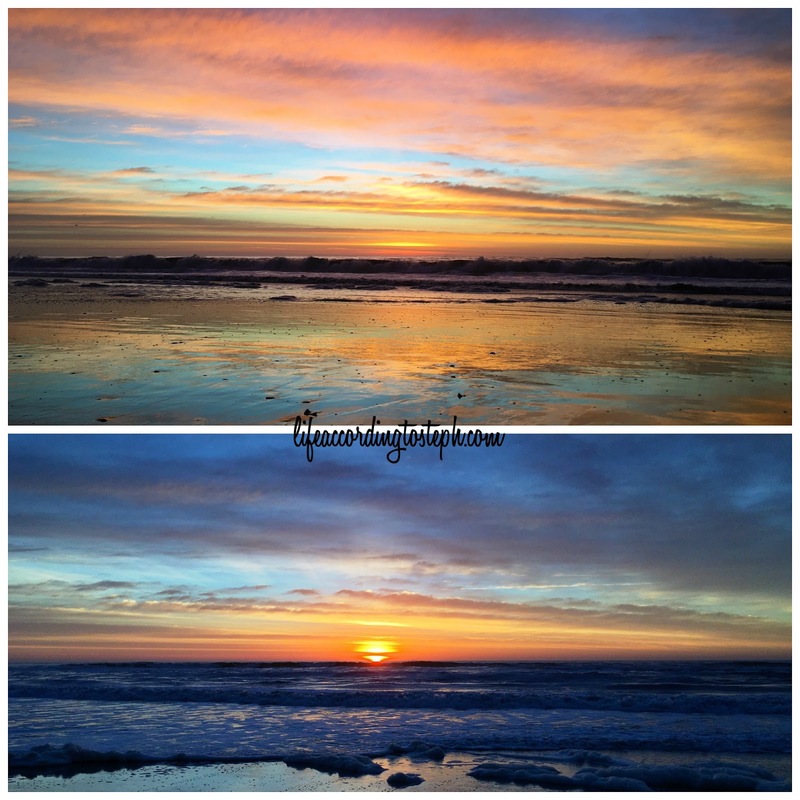 I'm so jealous of your beach sunrises!!! Looks like it was a great Thanksgiving weekend!! Love the pictures from the shore house.That ice cream looks so good. oh my word, are you kidding with the kid and the football?! that is insane. my mum would have murdered me if i did that as a kid. love that you volunteered to help those in need. we don't really do much for thanksgiving, so that is such a good idea for us next year. love the table that you made over! super cute. and oh, the rice! my cats knocked over a jar of quinoa once, so that was fun. These kind of changes for a holiday are all good. The weather was so nice! La vie est belle! I am tired out from decorating right now! Grateful I can rest a bit right now!! I had like 10 things to comment but then I lost it all when I got to dog stew. How did it go? did they eat it? Of course they did. Did they like it? Are they off dry food for good? I hate poor behaved children out in public. I wasn't allowed to act a fool in front of others, my nieces and nephews dont act a fool....so why are there all these fools out in the stores? Bad parenting!!! Those sunrise pictures are incredible!!! I love that MFD left to go decorate. Even if you had a decor war later :) Mae does not look like she enjoys having invaders on her body. And Geege looks awfully cute all snuggly...like he has a huge smile! Sounds like you packed your weekend to the brim, The sunrises on the shore are always gorgeous. Lol @ Santa on the roof. That doesn't seem safe. Looks like a really fun and productive weekend full of good food, family and yummy coffee. Love seeing all of your beach house updates! Yayyy for shore time during the holidays, I love seeing how everyone does Christmas here. It has a different feel that Christmas elsewhere. Your shore house is worth it alone just for the beautiful sunrises and sunsets. They're gorgeous! Your boy is smiling all snuggled up to momma, that is so, so cute. How's Mae since the tick was removed? Alright? holy cow, just reading everything you did makes me tired!! at least you had those gorgeous sunsets/sunrises...just those alone makes a beach house worth it! That honestly sounds like a great Thanksgiving. If you can't make some use of the day (other than eating til you pop), you might be missing the point. We didn't go anywhere because of terrible weather, but I think I'd rather volunteer next year. Oh tick removal. I know it well. I think everyone should volunteer at least once in their life on Thanksgiving day or Christmas day. I did it once here in Sydney, and it made my homesickness seem a lot less important. Why was MFD in a parade? Did I miss that? Wow, you really packed so much stuff into 4 days! 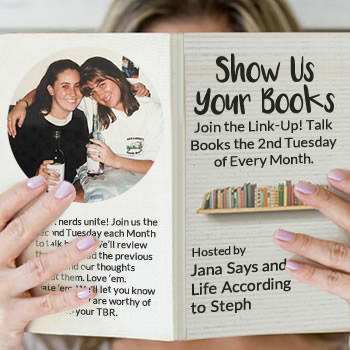 Is this the weekend that your shore house is being rented? Ocean City looks like such a cute town. I need to add this to our road trip list. Love all of the Christmas decorations at your house. I remember the reindeer and sleigh from last year because I wanted to get one too! Your turkey looks delicious and it sounds like you had a fantastic Thanksgiving weekend! I love the fact that y'all volunteered this year and even gave away your leftovers. This time of year definitely puts into perspective how much we have compared to how little others have. Woohoo! Our Christmas cards got delivered last night so I'm looking forward to sitting down and getting them ready to mail out tonight. Very cool that you volunteered on Thanksgiving. Also very cool that Santa was on the roof- haha! :) The shore house looks so freakin' awesome- love love LOVE everything you've done to it/put it in. I love your ocean pictures....I miss the sea so damn much. The pugs are so cute as always. I am living for the round chalkboard thing....I want one so badly....that is just too cute!!!!!!! LMAO at that top picture of you and the dogs on top of you! Bruce the turkey looks delicious. While we did get a turkey dinner at Friendsgiving, we have no leftovers. I think Aaron needs to do a turkey posthaste. Loving those sunrise pictures - so happy for you guys and your shore house! Your turkey looks great! Sounds like another busy busy weekend :) You were extremely brave to go to retail it up last weekend, you could not have paid me to do any shopping last weekend!! I do all online shopping to take advantage of the deals. We had so many leftovers, so we basically ate carbs for 5 days straight. Is it awful that as soon as you said your turkey was named Bruce, I pictured Bruce from Family Guy, and the turkey saying "Ohhh noooooo" as it went into the oven? Santa on the roof is AMAZING! Such beautiful sunrise photos: love. So glad you had a wonderful Thanksgiving! To brine or not to brine? Let's talk turkey.